Rob and Henrik drove around the block to see a Tesla Roadster while I ran into Pastaworks. 1 pound of egg pasta (linguine cut), a bunch of basil from Groundwork Organics and garlic rosemary focaccia for under $10. 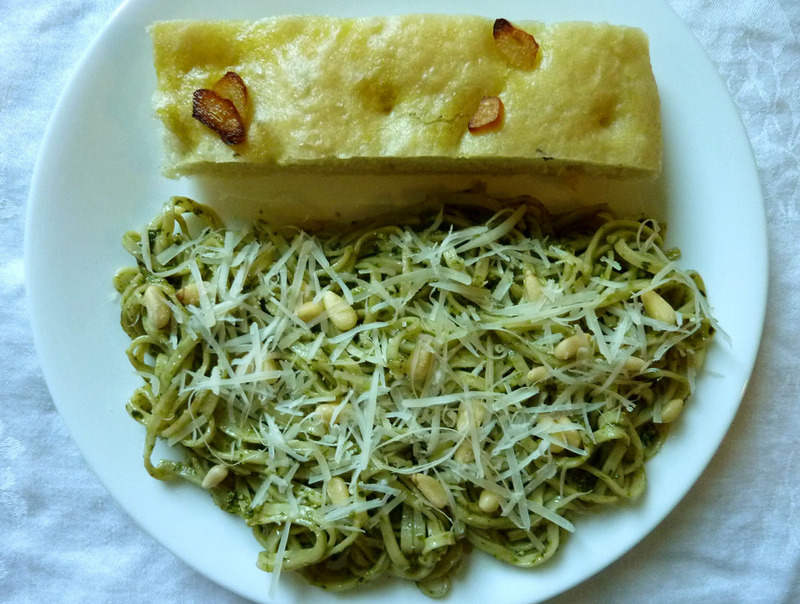 We had the olive oil, Parmesan and pine nuts for the pesto and the salad greens from the garden. $10 & 10 minutes–yum! The sun shone on us today and we tasted summer! This entry was posted in Eat, Food, Grow, Local, Seasonal. Bookmark the permalink. This entry was posted in Eat, Food, Grow, Local, Seasonal, Uncategorized. Bookmark the permalink.